The third volume of the "Yoder for Everyone" series. The second volume of the "Yoder for Everyone" series. To look inside the book, click here. The first volume of the "Yoder for Everyone" series, a three-volume series of Yoder's popular-level essays. To read the Introduction and Chapter 1, click here. To see a study guide for use in group or personal study, click here. 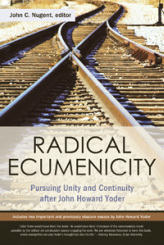 This collection of essays includes my article, "Spinning the Liturgical Turn: Why Yoder is Not an Ethicist." For full text of the Table of Contents and Introduction, click here. This collection of essays engages Peter Leithart's book Defending Constantine. For the book description, list of contributors, and endorsements, click here. This collection of essays includes my article, "John Howard Yoder and the Politics of Creation." This collection of essays engages the Reformed Two Kingdoms perspective. My essay is entitled, "Two Cities or Two Kingdoms? The Importance of the Ultimate in Reformed Social Thought." To read more about my essay and see endorsements for the book, click here. To read David VanDrunen's response, click here. "Overcoming Lamech: Lament as the Antidote to Violence"
In this article, I contend that the act of lamenting and voicing our desire for revenge is a biblical alternative to seeking violent vengeance. Peter Leithart's latest is a compelling critique of nationalism, especially the religion of Americanism. Ebook: "The Forest and the Trees: Engaging Paul Martens' The Heterodox Yoder." In these series of pieces, I engage Paul Martens book The Heterodox Yoder. Click here to access my ebook. Click here to access my shorter review. Click here to access Paul Martens' response to my ebook and review. Click here to access my reply to Martens' response. "The Emperor's New Clothes: A Review of Defending Constantine"
In this critical review, I engage Peter Leithart's provocative re-reading of the Emperor Constantine's conversion to Christianity and the affects of that conversion on subsequent Christianity. Excerpt: "My contention is that Christian pacifists must affirm certain points of continuity between Joshua, Jeremiah, and Jesus—conquest, exile, and cross—or else they may undermine the central logic of the biblical narrative and, along with it, our doctrine of God." Excerpt: "God instituted a weekly rhythm of work and rest for us. In a culture full of restless people seeking fulfillment in all kinds of things, a Sabbath people who mark a joyful rhythm of worship, rest, and work will be a powerful witness to the One who alone provides true rest." Excerpt: "There is a level of training that is needed to adequately address complex issues. Popular bloggers often have minimal theological training, and yet address issues like God’s sovereignty and salvation, sexual ethics, the importance (or not) of the church without providing the kind of subtle nuance and complexity that these issues often deserve. My issue is not that they should stifle their own opinion or quash any expression of their feelings on a topic. The issue is that their words carry weight. Even if they don’t intend to be pontificating, people will listen and people will follow."